The Dewalt 18v Brushless XR 5 Piece Kit contains the following Its ultra compact, lightweight design allows use in confined spaces. Compact (7.8in front to back), lightweight (1.62kg) design fits into tight areas. 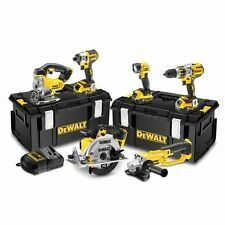 The item you are currently viewing is the Dewalt DCK550M3T Brushless 18V XR 5 Piece Kit c/w 3x 4.0ah Li-on Batteries. 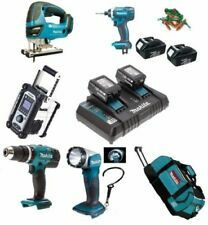 The DCK550M3T is a cordless kit comprising of DCD795N (Brushless). DCD886N (Brushless). DCF887 IMPACT DRIVER. DCS331 JIGSAW WITH SPOUT. DCS391 165MM CIRCULAR SAW WITH BLADE FENCE AND DUST ADAPTOR. 18 VOLT XR LI-ION 5 TOOL COMBO. 3 X DCB182 4 AH LI-ION BATTERIES. If you cancel your order by your mistake or change of minds. 100% authentics. Never opened. 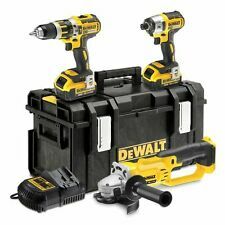 DEWALT 5-Tool 20V Li-Ion Brushless Combo Kit Soft Case Drill Saw Grinder. Shipped with USPS Priority Mail. This includes a dcs551, dcs381, dcs393, dcg412, dcd780, two dcb230, dcb203, and a dcb112. All tools appear to be in new condition, however some have minor cosmetic scratches. The tool bag included has several stains, and is definitely used, but there are no rips or tears. 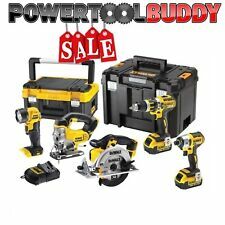 You are bidding on a DEWALT 5-Tool 20-volt Max Power Tool Combo Kit Model # DCK590L2. Condition is new!! Thanks for your bid!!! FREE SHIPPING + Dewalt Factory Warranty! DCF885 20V MAX 1/4" impact driver features 3 LED lights with 20 second delay to provide visibility without shadows. DEWALT 5-Tool 20-Volt Max Power Tool Combo Kit. DCS381: 20-volt MAX reciprocating saw with keyless blade clamp allows for quick blade change without touching the blade or the reciprocating shaft. DCF885: 20-volt MAX 1/4-in impact driver features 3 LEDs with a 20 second delay after trigger release to provide visibility without shadows. DCS380 20V MAX reciprocating saw with 4-position key-less blade clamp that allows for quick blade change without touching blade or reciprocating shaft. DCF885 20V MAX 1/4" impact driver features 3 LED lights with 20 second delay to provide visibility without shadows. Get the job done with this powerful cordless combo kit. Whether you are working on a DIY remodeling project or at the jobsite, this kit includes 5 tools to help tackle a variety of projects. Its ratcheting chuck provides superior bit retention for faster application speed. Condition is New in Box ! This is a The latest DeWalt power tools all lightweight - very powerful and ergonomically designed for ease of operation and comfort while in use ! Model number of its set is DCK520D1M1- see photo of the tools included ! MPN: DCK592L2. DCS380 20V MAX reciprocating saw with 4-position keyless blade clamp that allows for quick blade change without touching blade or reciprocating shaft. DCF885 20V MAX 1/4" impact driver features 3 LED lights with 20 second delay to provide visibility without shadows. PRODUCT OVERVIEW Model # DCK520D2. The DCK520D2 is backed by a DEWALT 3-year limited warranty for added peace of mind. This combo kit features a drill driver, impact driver, reciprocating saw, circular saw and work light. The DEWALT 20-Volt Max (3.0Ah) Lithium-Ion Combo Kit (5-Tool) is high-powered to tackle a wide range of applications. Cordless/ Corded: Cordless. Cordless Tool Type: Combo Kit. Includes: 1/2 in. impact driver, 6-1/2 in. This combo kit features a drill driver, impact driver, reciprocating saw, circular saw and work light. DCS381 20-Volt max reciprocating saw with keyless blade clamp allows for quick blade changes without touching blade or reciprocating shaft. The DCK590L2 kit includes the DCL040 LED work light. The DCS380 reciprocating saw has a 4-position blade clamp that allows for flush cutting and increased positional versatility with tool free blade changes. Electric Saw Grinder Cutter LIght Weight Heavy Duty Variable Speed Durable 20-Volt MAX Lithium-Ion Cordless Cut-Off Tool Kit with (2) Batteries 5Ah, Charger and Contractor Bag The DEWALT DCG412P2 cordless grinder is ideal for most metal cutting, finishing and polishing applications. This kit includes the DCG412 Grinder, (2) DCB205: 20-Volt Max XR premium Lithium-Ion battery (5.0 Ah), fast charger, spanner wrench, type 27 (Grinding) guard, 2-Position Side Handle and contractor bag. The kit is backed by a DEWALT 3 year Limited Warranty for added peace of mind.Finishing metal with wire stringer bead wheels, sanding flap discsClick here for more information on Electronic Recycling Programs2-position side handle offers greater control, comfort and versatility5Ah battery packs2-finger trigge. Hammer Drill Screw Driver Circular Saw Grinder Brushless Durable Cart Storage 20-Volt MAX Lithium-Ion Cordless Hammerdrill/Impact Driver/Circular Saw/Grinder Combo Kit (4-Tool) w/ ToughSystem Case The DCKTS450M2 20-Volt MAX Lithium-Ion 4-kit (4Ah) with a Tough System features our DCD796 20-Volt MAX XR Lithium-Ion Brushless Compact Hammer drill Kit which is lightweight and compact for working in tight spaces for long periods of time. The DCF885 20-Volt MAX Lithium-Ion 1/4 in. Impact Driver is compact and lightweight for fitting in tight spaces and increasing productivity. The DCS570 20-Volt MAX XR Circular Saw, features a Brushless motor which provides 5200RPM maintaining speed under load. The DCG412 20-Volt MAX XR Lithium-Ion 4-1/2 in. / 5 in. Grinder increases productivity with features like Quick-Change wheel release, convenient trigge. 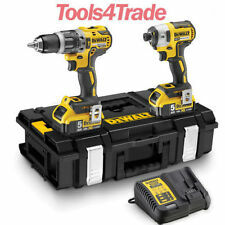 DEWALT 5-Tool 20-Volt Max Power Tool Combo Kit with Soft Case Easy To Use NEW! DEWALT 4-Tool 20-Volt Max Power Tool Combo Kit with Soft Case (Charger Included). Condition is New. Shipped with USPS Priority Mail. 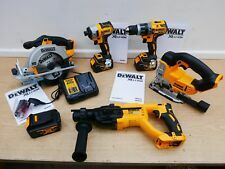 The item you are currently viewing is the Dewalt DCK550M3T Brushless 18V XR 5 Piece Kit c/w 3x 4.0ah Li-on Batteries. The DCK550M3T is a cordless kit comprising of T-STAK I KIT BOX. T-STAK VI KIT BOX. 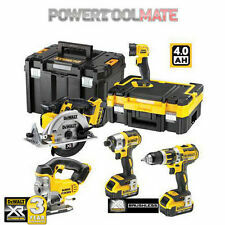 DEWALT Max 20 V 5-Tool Lithium-Ion Cordless Combo Kit - DCK590L2. Condition is New. Shipped with UPS Ground. The DEWALT 20-Volt Max (3.0Ah) Lithium-Ion Combo Kit (5-Tool) is high-powered to tackle a wide range of applications. Cordless/ Corded: Cordless. Cordless Tool Type: Combo Kit. Battery Power Type: Lithium Ion.